Even if you’ve a passing in cars or motor racing there’s a strong likelihood you’re familiar with the brilliant and unique art work created by Ian Cook. 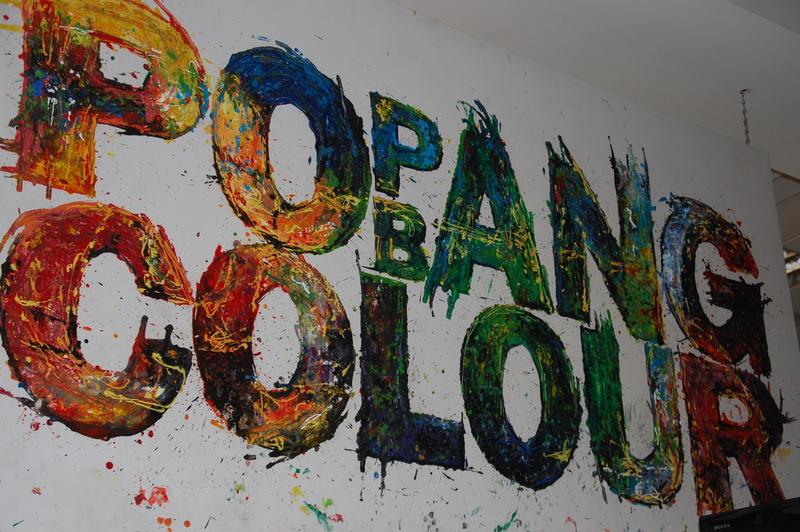 If his own name doesn’t ring any bells, chances are you’re aware of his pseudonym, PopBangColour, the brand he’s created to become the art phenomenon he is now and an omnipresent, paint splattered force across social media platforms. Even for me, as someone privileged enough to be able to call him a friend, a mental reminder is required before opening my mouth that his name’s ‘Ian’ and not ‘Pop’. 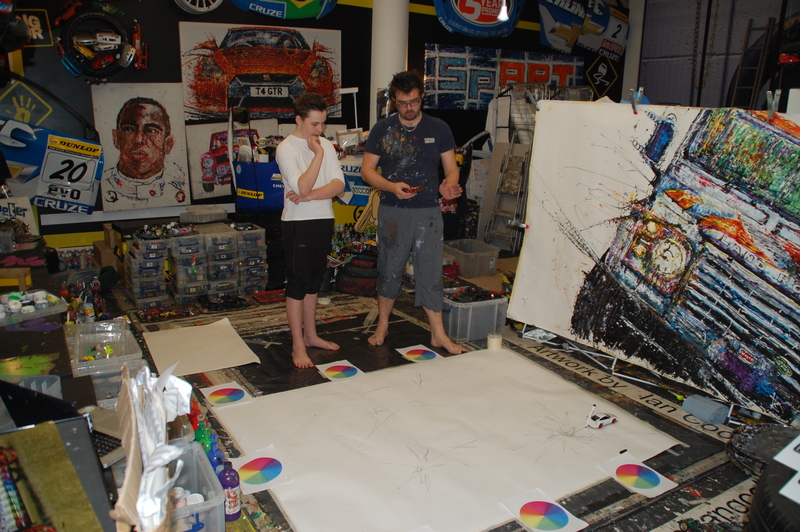 The deserved darling of the automotive industry, having Ian at an event never fails to draw a crowd of amazed bystanders stood open-mouthed as he creates supersized commissions of icons of the road and track or portraits of famous drivers. If he’s at Autosport International, Goodwood or Silverstone, there’s usually a throng around him bigger than some of the stands with new metal and scantily clad models draped over them. Watching Ian at work is mesmerising. You’ll be aware, unless you’ve been living in a cave for the past few years or you’re immune to all forms of printed, online or televisual media, that Ian’s USP is that he paints without using brushes. 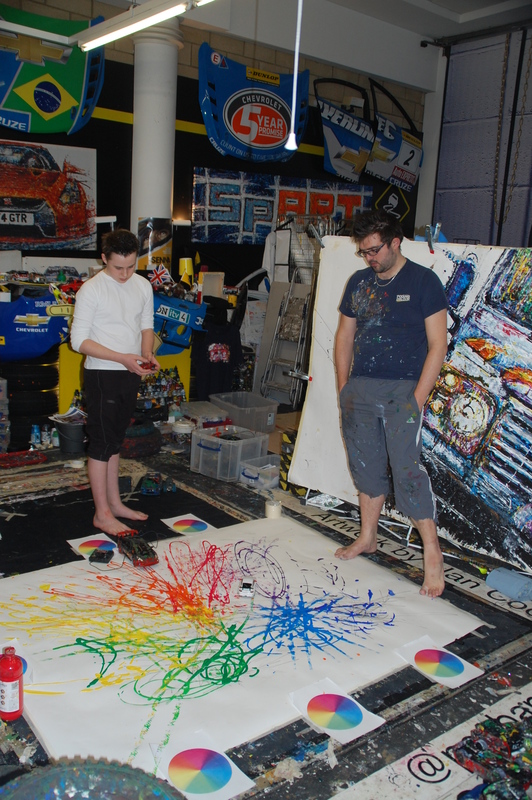 To convert seemingly random puddles of paint and ink dashed across enormous sheets of paper into the fabulous images which have become his trademark, Ian uses an array of remote and radio controlled cars, die cast models and selection of differently treaded tyres. The effect is astounding. There’s so much movement, vibrancy and drama in Ian’s work that they could be assumed to be animations if glanced at. Yet closer study reveals depth in quality, with so much texture, shape and colour to explore. Clichéd maybe, but whenever you revisit an Ian Cook original you notice so much more that had escaped you previously. There’s years of discovery embedded into every piece. Today’s pre-arranged encounter with Ian was more special than most. 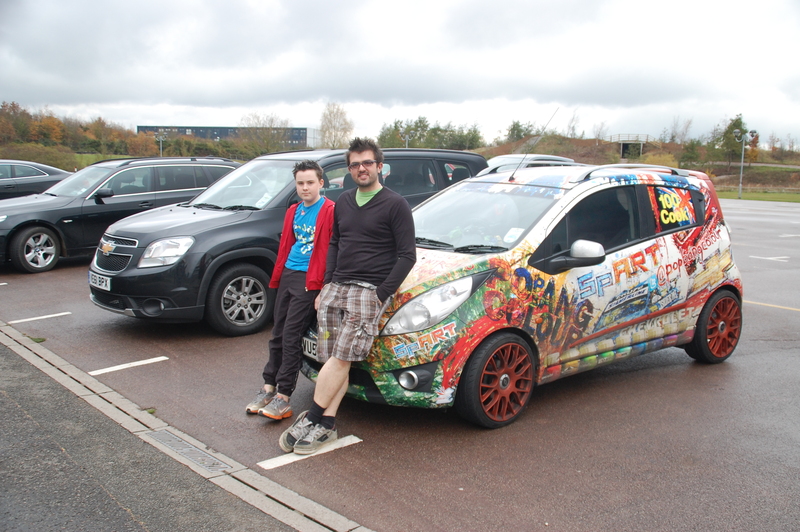 Visiting his studio at the Heritage Motor Centre museum in Gaydon, my eldest son, Jack, was booked in to have a crash course in painting with cars. First up was to draw a simple face, using only a marker pen taped to the back of a radio controlled Porsche 911. Ian’s nailed this to within 45 seconds; the act was central to one of his first TV appearances some years ago on the Paul O’Grady Show. 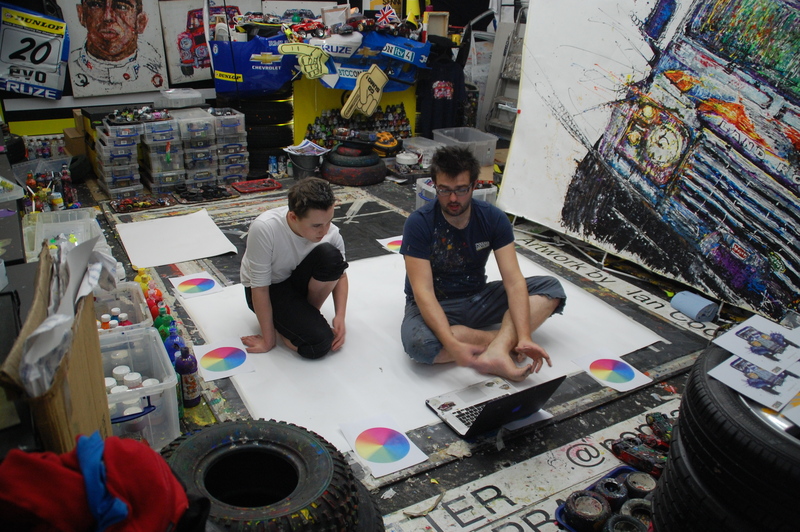 Once the technique of short bursts back and forth with opposite lock flicking from one side to the other, Jack progressed onto a huge colour wheel. With encouragement from Ian, liberal squirts of vibrant primary and secondary shades sat atop the paper, awaiting blending by a series of cars criss-crossing the canvas, before tyre treads were used to pummel the paper and sprint paint across the everything within a four foot radius. Is that Ian Cook? Or Daniel Radcliffe having fallen on hard times..? 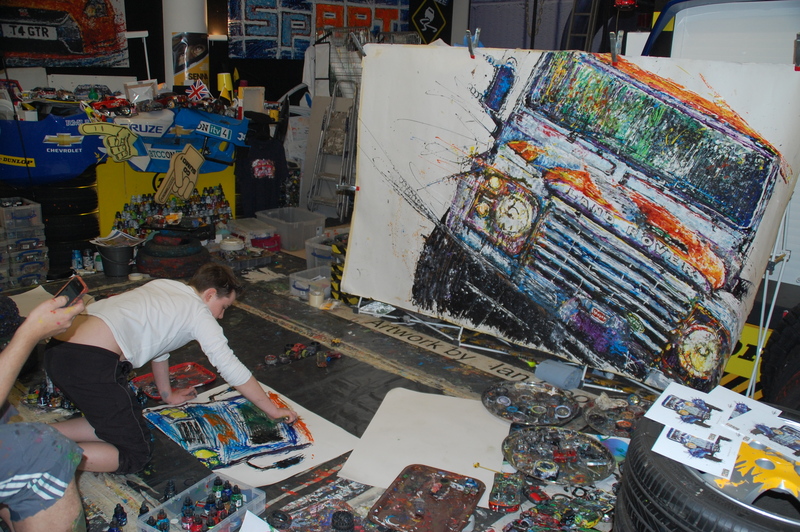 The final project was to use oils to create a miniature version of one of Ian’s latest pieces – an inclined, head-on image of Land Rover’s famous Defender. Jack’s never been bitten by the car geek bug but he captured the essence of the Solihull workhorse quickly. I don’t normally serve out unsolicited advice but breaking my own rule I’ll insist that at the very least you follow Ian on Twitter and keep tabs on where you can see him in action in 2013. Not only is he achingly talented, he’s a genuinely nice guy who makes time to talk too.